Background: The incidence of diabetes mellitus has increased drastically over the past few decades. This oxidant-antioxidant imbalance resulting in complication of diabetes mellitus includes macro- and microvascular complications. Resistance to conventional treatment and patient compliance has paved the way to the usage of effective natural products and supplements. Momordica charantia (bitter gourd) is widely consumed in many parts of Malaysia as a vegetable. Momordica charantia (MC) is mainly used in the management of diabetes mellitus. Objective: The present review discusses the literature concerning the antidiabetic and antioxidant properties of MC focusing on the complication of diabetes mellitus along with its mode of delivery. We found that among the whole part of MC, its fruit extract has been widely studied, therapeutically. The evidence based analysis of the beneficiary effects of MC on the different organs involved in diabetes complication is also highlighted. 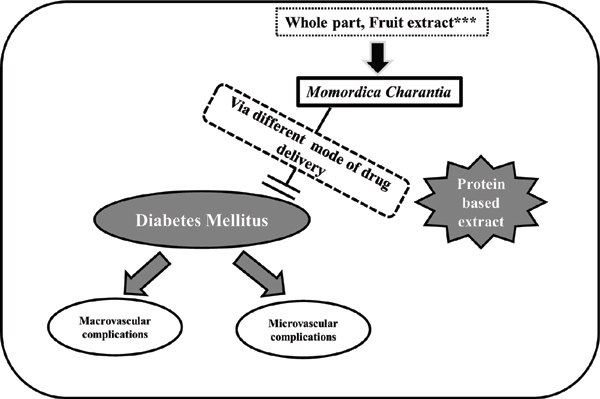 This review elucidated an essential understanding of MC based drug delivery system in both clinical and experimental studies and appraised the great potential of the protein based MC extract against diabetes mellitus. Conclusion: The review paper is believed to assist the researchers and medical personnel in treating diabetic associated complications. Keywords: Antioxidant, complications, diabetes mellitus, drug delivery, Momordica charantia, oxidant. Keywords:Antioxidant, complications, diabetes mellitus, drug delivery, Momordica charantia, oxidant. Abstract:Background: The incidence of diabetes mellitus has increased drastically over the past few decades. This oxidant-antioxidant imbalance resulting in complication of diabetes mellitus includes macro- and microvascular complications. Resistance to conventional treatment and patient compliance has paved the way to the usage of effective natural products and supplements. Momordica charantia (bitter gourd) is widely consumed in many parts of Malaysia as a vegetable. Momordica charantia (MC) is mainly used in the management of diabetes mellitus.